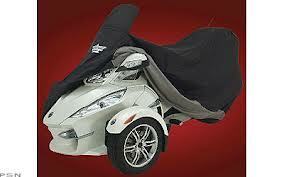 With the top selling conventional Trike cover, UltraGard® now covers the Can Am Spyder Roadster RT series. 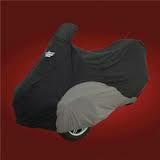 This latest UltraGard® cover is custom fitted around the Can Am Spyder RT for a great tailored fit. UltraGard® strength and durability comes from its strong double stitched folded and interlocking seams with specially dyed and woven polyester fabric with a water resistant polyurethane coating applied. An expandable windshield pocket protects your windshield from scratches with UltraGard® own Softek™ liner. An elastic hem with 2 bungees attached to rust proof grommets allow additional adjustments to keep a snug fit. Includes high visibility reflective piping and logo to allow your covered Spyder RT to be seen in dark parking lots. Available in Black over Charcoal, BBP # 4-475BC.